For more photos and information about this makeover, visit Chania’s blog. 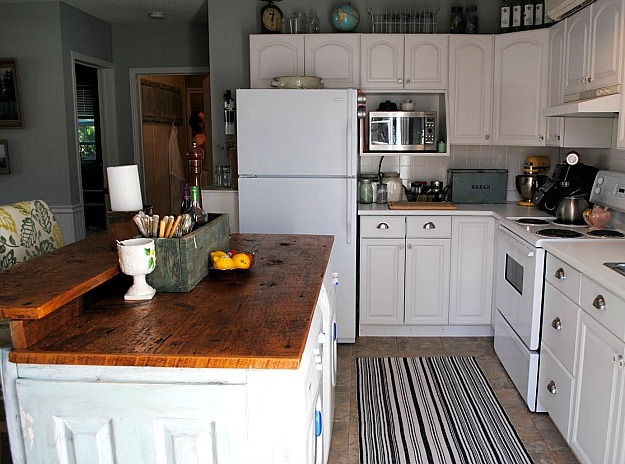 A Builder-Basic Kitchen Goes "Bedford Gray"
I love the makeover, another attestation to what a coat of paint can do! And that is the only way to do an island, with a step up to hide the mess in the kitchen when you are at the dining table. Without that, forget it! We redid our first floor and that was my MUST. What a great job! Re-using what’s still good instead of throwing it all away for the latest fad. It looks very nice and crisp! Excellent! Have a Wonderful day Julia and thank you for the mention the other day. I appreciate it, my friend. I am loving all these “real life” make-overs. It is so fun to see the individual personalities that are manifested in these creative designs! Thanks for sharing! 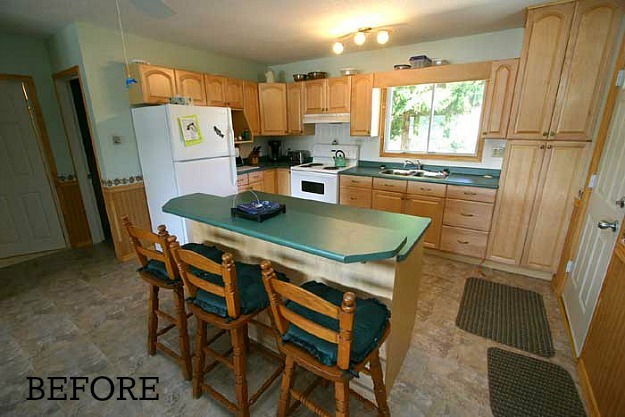 Actually, I like both versions of this kitchen. The new remodel is more up-to-date and fits the current trends, but I liked the colors and restraint in the original version too. I wonder what the very large white box is above the stove? I think that box is the air conditioning unit. Love that island. Need to find someone who is tearing down a barn! Hi Cassie! Loved reading your answers to Emily’s questions, too. I also love that she worked with what she had. 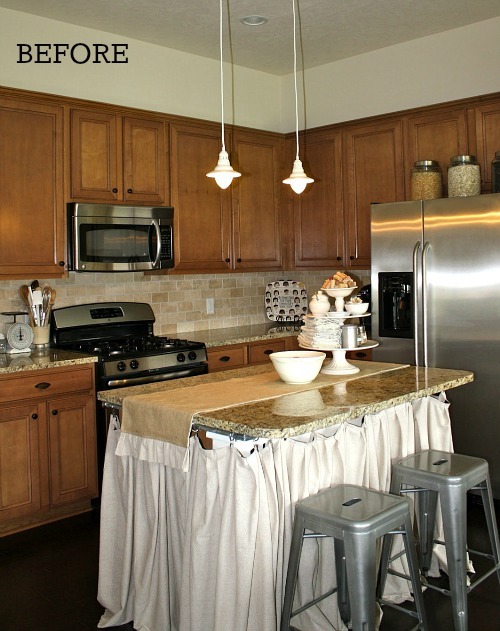 The lighting fixture is great, and so is the rest of the decor. Well done! 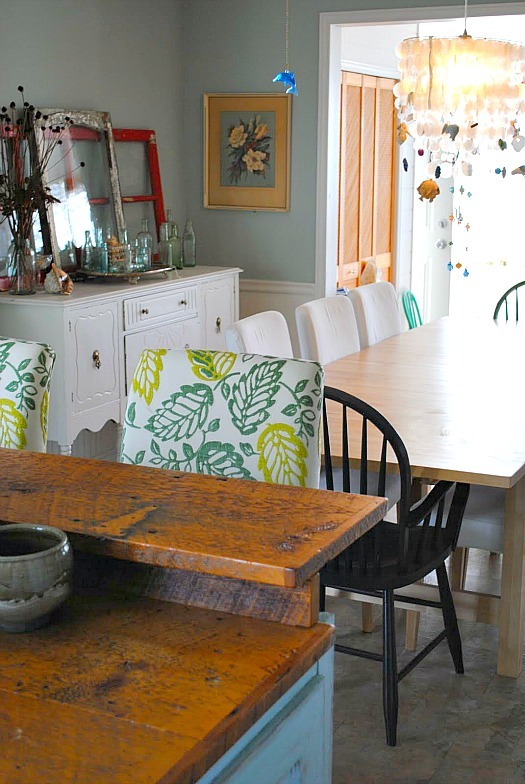 Love it, especially the wood counter! 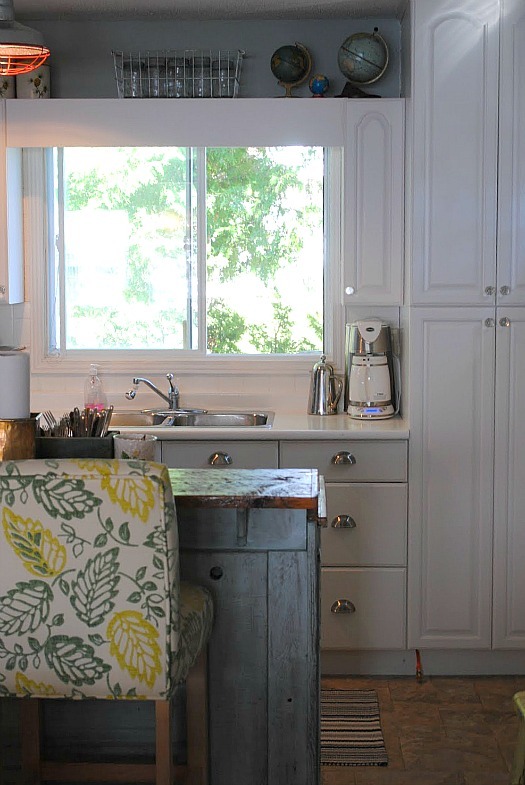 My kitchen isn’t (yet) as cozy as this one but I painted my cabinets from builder’s honey oak to white and the transformation was breathtaking. 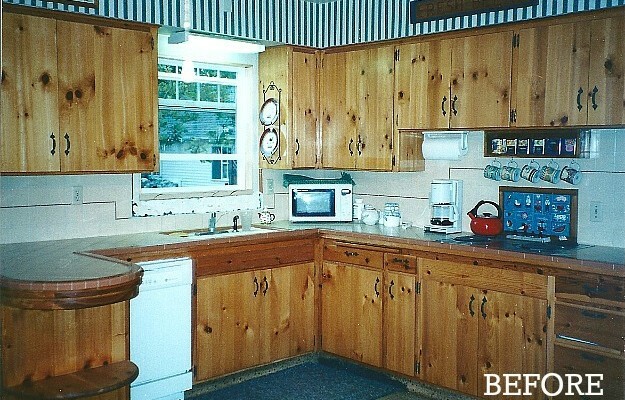 I plan to take out the existing counter tops and replace them with wood (one thing at a time). I can’t wait. I think about it all the time. I also am putting in wood floors. My husband thinks I am NUTS! “Wood in the kitchen, with all that water? !” I asked him about the thousands of years of wooden boats. That has stopped the chatter for a while. 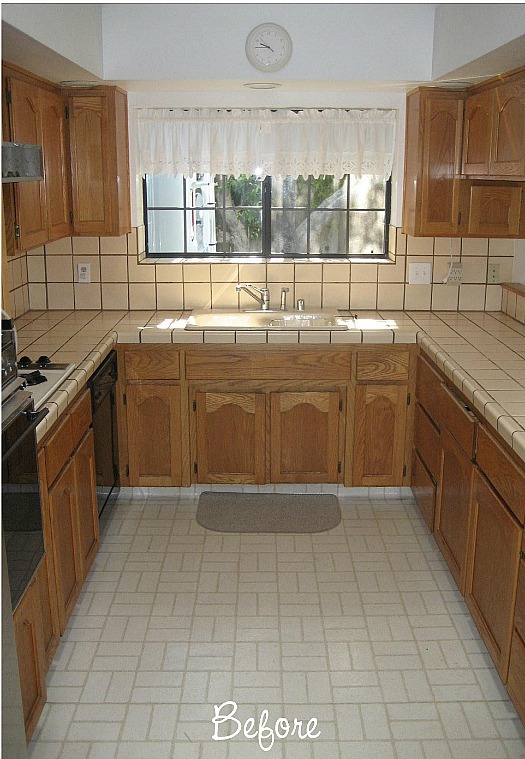 I will show him this kitchen, which should shut him up for good! Beautiful, beautiful, beautiful!! I was out of town for about 4 days and just catching up. The Kardashian site is closed? Really? Just wanted to say that some things are sacred. I hope this is a Kardashian-free zone. That’s it. Nothing snarky. Was just surprised. PS: I meant to say that I was surprised that she made it on to this site. What a beautiful transformation! It doesn’t even look like the same space, they did a fantastic job!! Great makeover Chania! 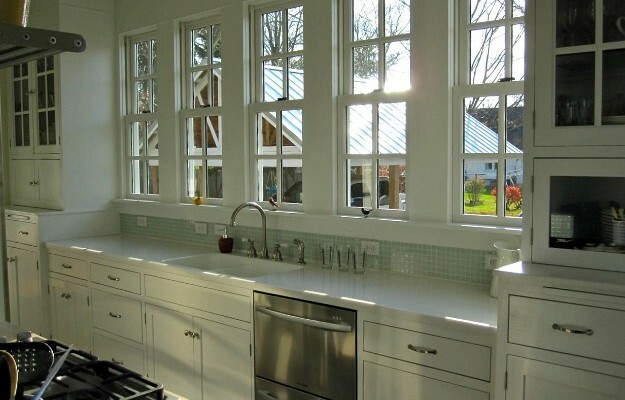 And yes, those wooden barn planks are wonderful and make the kitchen!! Really good job. Oh my! 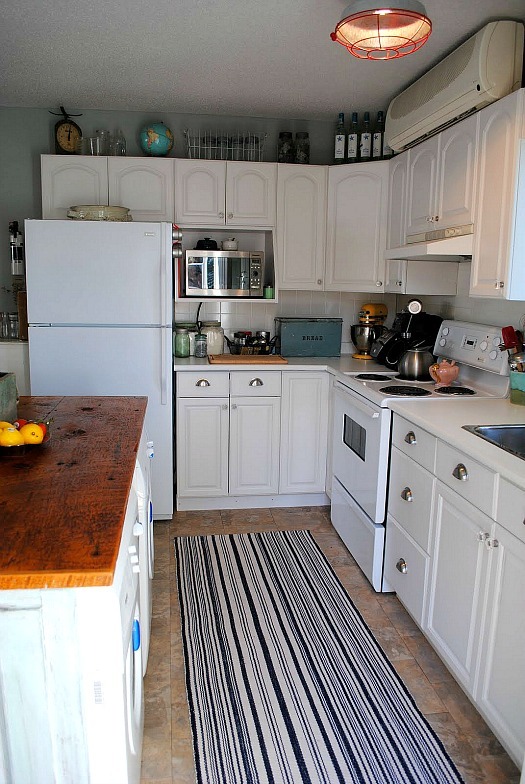 I LOVE the countertops on the island! 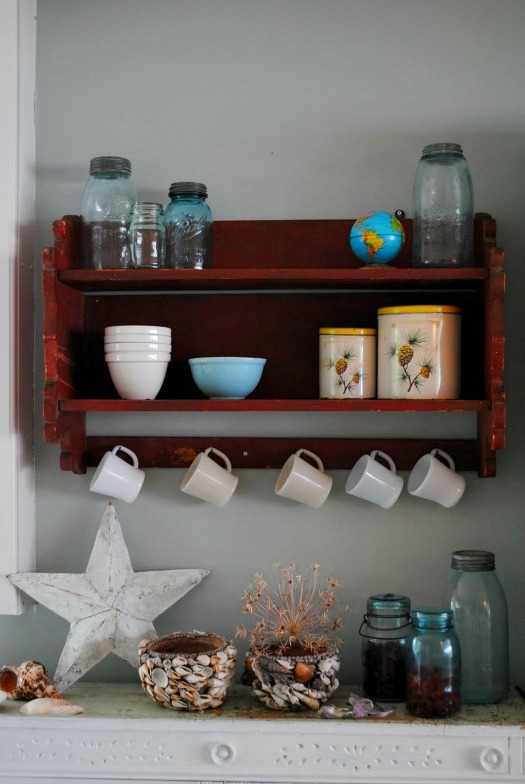 But I think my favorite thing about this kitchen is that it is so personalized with sweet little collectibles, like the globes and vintage tins. Charming!